I love discussing self-care. From mental & personal development to fitness, health and beauty. 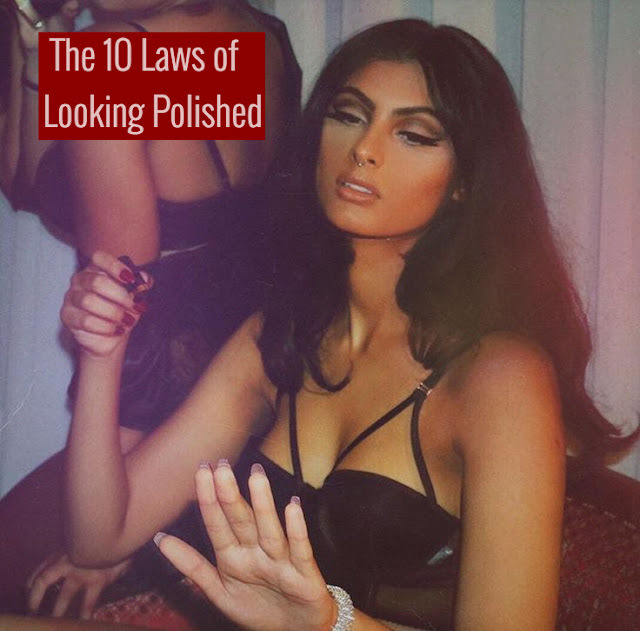 Today, let's explore the topic of looking polished. My definition of looking polished doesn't mean being glammed up 24/7. It's more about paying attention to the details. When you're out in public places, you might be able to spot the difference between those who got ready and those who take pride in themselves. Let's discuss the little things that demonstrate pride in our personal appearance. I chose to list nails first because nails are a small thing that make a big difference. Have you ever been in a conversation with someone who happened to happened to glance at your nails (or toes) and show a slight look of disappointment? I have. For some reason, unkept nails are a huge turnoff. They are literally the tell tale sign of "I don't take care of myself." "I allow my polish to chip beyond recognition, my fingernails to look uneven and I allow a little dirt under the fingernails.....and I do nothing about it." Unkept nails are the exact opposite of looking polished! On the flip side, you can see a girl wearing the most casual of clothes. But then you notice her well cared for hands (and feet) and you think to yourself, "she cares about the little details." We've already discussed the power of staying on top of your nail care regimen. It literally can change your life. Skin is one of those things that people use to judge us. It tells people how old we are and it represents how well we care for ourselves. People who suffer from acne are stereotyped as not taking care of their skin. Back in the day, when I suffered from cystic acne, people would subconsciously scratch/or touch the area of their face where I had a break out. It was as if my pimples were bothering them. It was a distraction, plain and simple. That's why I made it my mission to have the most flawless skin possible! I'm not there yet, but I'm working hard towards my end goal. The journey for perfect skin never ends! We must be diligent to constantly improve. If you can't remember the last time someone complimented you on your skin (face or body), there's still work to do. The fastest way to look unpolished is to show physical signs of dryness. Dry cuticles, dry lips, dry hands, feet, dry anything will say to yourself and others. "I don't care about how I look." In nature, dryness is a sign of death. Nothing grows in the desert. But the amazon, which receives ample amounts of precipitation, is the mecca of abundant wildlife and exotic vegetation. Never, ever demonstrate outward signs of dryness. I have to admit that I'm guilty of violating this law in the past. And believe me, people notice. One action I've taken to tackle this issue head on is to drink water like I mean it. When the body is well hydrated, it shows. Once upon a time, I'd visit the hair salon to get it straightened. What would happen afterwards had me baffled. Suddenly people start treating me different. The attention I received from just changing my hair was a bit puzzling but it taught me how much of an affect our hair has on the way we look and feel. I rarely do anything fancy with my hair anymore which really takes away from my goal of looking polished. Since I'm not a fan of regular salon visits, I have to come up with a different strategy. First, never allow my hair to look dry. Second, I need to catch up on my micro-trimming schedule Third find some every day, low maintenance styles that still demonstrate pride in my personal appearance. I'm collecting some inspiration pics that I'll share in a separate post. 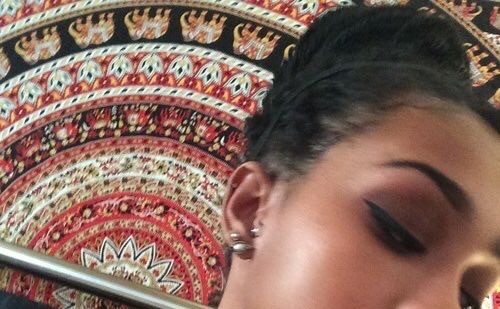 One skill to learn before the end of the year is to learn how to perfect your brow routine. The brows frame the face and set the foundation for everything else you do. Perfect brows are one of those things that make you look amazing even if you're one of those people who doesn't like to wear much makeup. Just cleaning them up and having the ability to fill & create the perfect natural arch will do wonders for helping your look completely polished. We have beautiful, full lips. But sometimes we miss the opportunity to adorn them. 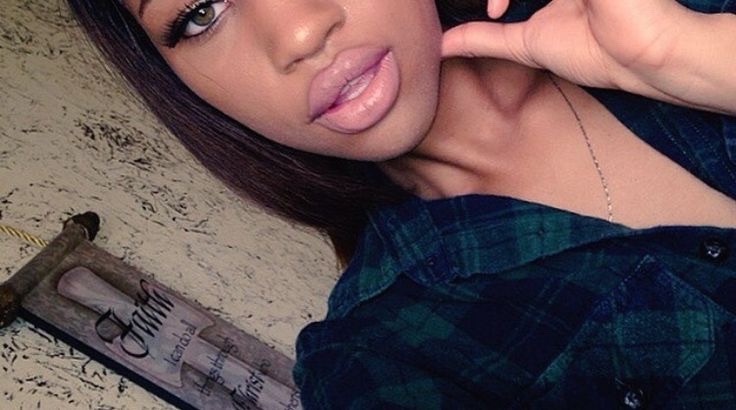 When I'm out in public, I notice that many women choose not to do anything with their lips. Especially women with fuller lips. But I'm here to say, that mastering your daily lip look will greatly enhance how polished you appear. Even if you wear a simple moisturizer on them, that's ok, just don't let them go naked. Law # 7 "Girl, you smell gooooood." Your scent is one of the most powerful way to leave a positive impression on others. 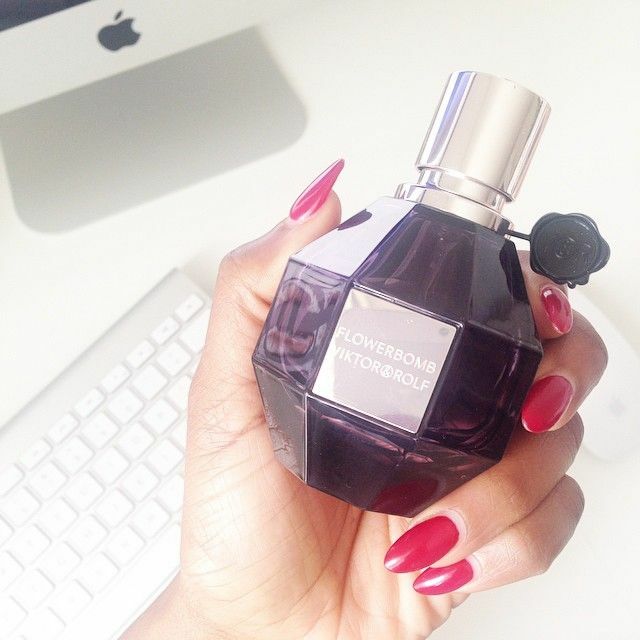 As part of your signature style, you should have a go-to fragrance that your absolutely love! Bonus points if that fragrance evokes a positive response from others. I invite you to also wear fragrance when you're at home, even if you have no where to go, as part of your personal feel good routine. Law #8 Styled to the nines. We've talked at length about the wonders of dressing your best. We've even established the importance of looking presentable even when you're loungin' at home. I'm not saying you've got to spend a lot of money on clothes. Just be strategic about it. Plan ahead to save time and create well thought out looks. Leverage outerwear to elevate your outfit looks. Pair with the perfect shoes and you're good to go. If you're one of those people who like to dress down, accessories are your friend. The great thing about accessories is that they range from chunky, bold statement pieces to minimalist items that enhance your current look. You don't have to go overboard if you don't want to you. I present to you Exhibit A: Miss Jennifer Lopez looking extremely put together in the most basic of attire. Notice her strategic use of accessories (earrings, cuff bracelet, shades, pinky ring) to compliment her look. Oh, and did you notice her nails? Law #10 Shine! Shine! Shine! Lastly, ladies, I urge you to incorporate shine, in one form or another. What do I mean when I say shine? You decide. This could mean adding a little lip gloss. Shine could be having glowing skin that beautifully reflects light. Shine could be those sparkly earrings that compliment your casual looks. Shine can also mean having highly moisturized hair. Shine might be the light reflecting eyeshadow that you wear on the inner corners of your eyes. Something on you should shine, or catch someone's eye. Shine is buffing scuff marks from your shoes prior to wearing them out. Everyday, before you walk out that door, ask yourself, what is it about me that shines? If you don't have an answer, then resolve it. Subconsciously, I have been doing some of these! I am a new mother on a tight budget but I try to look put together before I go out. I get compliments on my skin, hair, nails, and style all the time. Probably more now since becoming a Mom. It can be difficult looking polished when you are wrangling a 5 month old at home but it just takes more planning & effort. This post motivates me to keep it up! Thanks Nadege. Michelle, you're so awesome! Being committed to looking polished while raising a newborn is no small feat. You're my hero. Seriously. Angela! Glad you enjoyed it! Awesome post Nadege! I'm coloring my hair as we speak. I needed this post to remind me to always present my best self. Next I'm going to get a mani/pedi. Today will be a beauty day! Great post. Love JLo's look in that picture. Doesn't she look great guys? Thanks for this post. I love lists like this, and it comes at a perfect time. Four times a year I use a long weekend to re-fro (Labor Day is one of them! ), put my body & surroundings back together, and start fresh. I focus on routines and parts of my life that need to get tightened up. I've let my nails fall to the wayside recently...and I know it!...so that was my inspiration today. Have a great day! I ran across this blog a few weeks ago and I have been hooked ever since! Because of you, I increased my water intake and I get my hair braided and mani/pedi done every two weeks. I never really paid attention to these little details before but it has made a big difference. I am also upgrading my wardrobe little by little. Thank you so much and I will definitely continue to view your blog you are doing a wonderful job. Just great! These are all the things on my heart to maintain - there's no feeling like even having one of these consistently done! I struggle with pedis at the moment though... I'm pregnant and find it hard to take care of my feet, and don't really have the budget to pay for it. This is a good reference post - many thanks! My sentiments exactly! Great post! You have no idea how much your blog has helped me step my game up! I've incorporated many of your skincare and style tips into my life, including exfoliating daily, using body oil for nourishment and shine, drinking lemon water, investing in key style pieces, and more. However, this post is probably my favorite: it's a summarized cheat sheet on how to look flawless every single day! Since reading your 10 Laws, I'm paying more attention to my skin, lips, brows, and hair--factors that make a huge impact in my image and self esteem. My favorite tip, however, is Law #10. Every day, I make sure that at least *one* thing about me shines (aside from my moisturized skin & lips)--for me, it's usually jewelry or a gold highlight in the inner corners of my eyes. It is a simple trick that instantly upgrades my look. Thank you for reminding us that it's all in the details! You have helped me build a routine that makes me feel confident and ready for the day ahead. Tay, your comment made me so happy. You have no idea. I came across this on Pinterest and wanted to say thank you for putting it on a list. They are things that remind you to be diligent in the care of yourself. I found it important cause although I dont make new year resolutions I decided in 2016 I was going to be diligent and grateful. SO, I am grateful to have stumbled on this reminder and I truly agree with each one. Im approaching 40 and find myself in a funk I told someone I look terrible from my nails to my toes, suddenly having skin issues, hair in the awkward grow out I feel like my style just slipped away. I needed this reminder. I will be diligent about caring for myself inside and out. For years, I searched for a simple but effective guide like this. I've been so clueless - male blogs and mags do a better job at addressing the clueless in a tangible way.. until now. I'm obsessed with this blog and how you write posts addressing exactly all the things I wonder about. A WOC too? Unmitigated girl crush on 9000. Thanks Anon. I'm really glad you enjoyed the article. Thanks for kind words.